NATIONAL HARBOR, MD (AUGUST 22, 2017) — Attendees of the 2017 IRS Tax Forum in National Harbor, Md., are in luck. They can skip driving an hour north to the nearest casino: Scriptel Corporation is flush with its own exciting news. 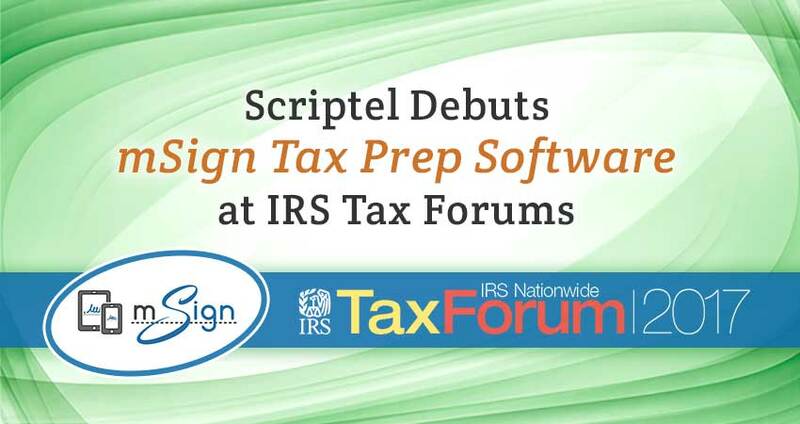 Ohio-based Scriptel, which is a known leader in the electronic signature pad and digitizing components industries, will be represented Aug. 22 and 23, extending its IRS Tax Forum debut of ScripTouch mSign software—perfect for tax preparer use alongside existing ScripTouch signature capture pads. There are giveaways planned, as well. Having exhibited in Orlando this July, the Scriptel team is excited to be in the DC area. CrossLink, a Scriptel technology partner, also fills a need within the tax preparation industry. Several of its tax professional solutions—like CrossLink 1040—are already integrated to work seamlessly with Scriptel’s ScripTouch signature pad series. Sign and Save also works as a standalone for on-the-go tax document signing. Yet, there are other lucky turns to be had by visiting the Scriptel booth. The forum itself is chock full of chance encounters. Taxpayer Advocate Service notes that the tax news, law and education conference is aimed at preparers with the added bonus of serving as a platform for tax case resolution. Tax industry types in search of training, Continuing Education (CE) or Certified Financial Planner (CFP) credits and networking opportunities can take advantage of those, as well. More information is available at IRSTaxForum.com. Scriptel joins 80-plus other companies at this year’s National Harbor IRS Tax Forum. Then it’s off to Las Vegas, where team members will be on hand to field questions, expand on its many product applications and lead live demonstrations. Moreover, he says, get a sense for how Scriptel improves preparation, submission, authentication and digital workflow processes for tax industry and other business users. Visit Scriptel at the IRS Tax Forum and learn even more at Scriptel.com. Scriptel Corp. (est. 1982) – An innovator in the e-sign and digitizer component industries, Scriptel debuted its first peripheral in the late 1980s. It has since become a trusted leader in capacitive pen and Citrix Ready electronic signature pad technology with POS, healthcare and other professional applications. Software solutions include EasyScript 3.0, ScripTouch Remote and now mSign — turning any mobile device into a wireless signature pad. Copyright © 2017, Scriptel Corporation. Scriptel®, ScripTouch®, Assist™, EasyScript™, mSign™, OmniScript™, ProScript™, StaticCap™, and Sign and Save™, along with their associated logos, are the property of Scriptel Corporation.